Sydney - Losing to New Zealand in the World Cup pool stage was the kick up the backside Australia needed and the subsequent improvement was on show in their semi-final victory over India on Thursday, captain Michael Clarke has said. Australia have a chance to gain revenge on their neighbours for the one-wicket defeat in an Eden Park bearpit last month when they meet the unbeaten Black Caps at Melbourne Cricket Ground on Sunday. 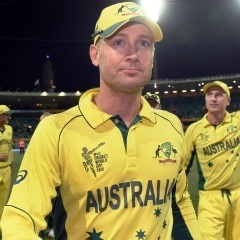 "I believe that was the turning point in this tournament for the Australian team," Clarke said. "I think that gave us a bit of a kick up the backside. We knew we got a good look at a very good team playing at the top of their game and I think our attitude from that day has been exceptional. "The boys have got out of bed every single day to try and become better, and I think you've seen that in our results." Fired by Steve Smith's 105, Australia scored a World Cup semi-final record 328 for seven before dismissing the reigning champions for 233 for a thumping 95-run victory. "I can't speak highly enough for the way he's batting at the moment. He's showing his class," Clarke said of Smith. "He's still training extremely hard, still getting there early, still doing the work even though he's batting so well, and I can't say I'm surprised he's getting the results he's getting. He's earned it." While Clarke picked New Zealand's new ball attack as their main strength, he also paid tribute to his own pace bowlers, led by Mitchell Johnson, and the role they played in the victory over India. Johnson ended up with figures of 2-50 but those stark statistics gave only an inkling of his contribution after he had Virat Kohli caught for one and smashed the wickets of Rohit Sharma to remove the opener for 34. "Two crucial wickets," said Clarke. "Mitch is Mitch, he's a class performer. He probably hasn't had the standout tournament everybody expecting, because they expect him to take five wickets every time walks onto the field, but I think he's done the job for this team. "I couldn't be prouder of our bowling unit in general. Every one."